label Optional label in front of the field. selectedValue The value of the option the field shows. displayedOptions An array with the displayed options the user can choose from. optionValues An array with the values for each option. If optionValues a direct mapping of selectedValue to displayedOptions is assumed. int The value of the option that has been selected by the user. 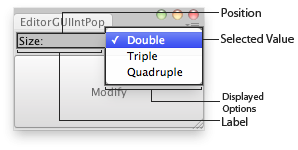 Makes an integer popup selection field. Takes the currently selected integer as a parameter and returns the integer selected by the user. Int Popup in an Editor Window. // Multiplies the scale of the selected transform.